Agway® Greenlawn® products are the quality choice in complete lawn care. You determine your lawn needs, and you’ll find a Greenlawn® product to help you. Fertilizers, lawn starters, crabgrass prevention, weed and insect control, winterizers – everything your lawn needs for a lush, green lawn and year-round protection. Each one is easy to apply and guaranteed to produce quick, long-lasting results. 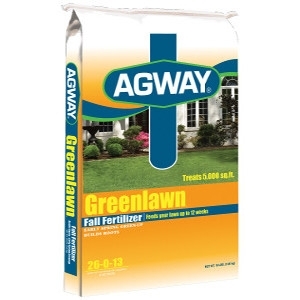 Agway® Greenlawn® Fall Fertilizer is designed for use in the fall – the most important time of year for feeding your lawn. It helps established grass continue to grow strong, vigorous roots and prepares grass for surviving winter stress. This special formulation helps maintain a thick, green lawn through the fall months and provides for an early spring greening. For best results, apply Agway® Greenlawn® during the fall months of October 1 through November 30. Feeds your lawn up to twelve (12) weeks.